Confidence to use options as part of hedging tool-kit. Sharing information with trusted advisor. Xero is a phenomenal success story. From its beginnings in 2006, Xero has grown to a $407 million revenue, ASX listed, global company with offices in New Zealand, Australia, UK, US, Canada, Asia and South Africa. The Xero platorm is available in over 180 different countries and its app market place has over 700 add-ons that have been built by third party vendors. And it all started in Wellington, New Zealand. Leveraging the opportunities presented by cloud-computing, Xero set out to offer small and mid-sized businesses an alternative to traditional, clunky, desk-top accounting software. Xero is the poster child of tech innovation in New Zealand and has smashed the perception of what can be achieved from the bottom of the planet. The increased complexity and quantum of Xero’s foreign exchange exposures required the treasury function to become more sophisticated. Hedging was traditionally transacted in its most basic form — forward exchange contracts — but Xero’s treasury team were keen to explore alternative hedging instruments. Tom continues, “When considering the use of FX options as one of our hedging tools, a key decision was being able to use those sophisticated products with more control. Hedgebook gives us independent valuations and clear visibility of our overall hedging position. We have board approved risk control limits, so it is critical we remain within these bounds.” A balanced foreign exchange hedge book will consist of a range of hedging instruments, from the vanilla to the more sophisticated. Understanding the mix of the hedging in place and the potential outcomes from future movements in exchange rates is critical to robust risk management. Hedgebook provides this oversight so Tom and the team can be confident that foreign exchange risk is managed within an environment of control and compliance. Every company is different in its approach to foreign exchange management. Factors such as the ability to pass-through adverse foreign exchange movements to your products selling price, the competitive landscape, the risk appetite of the organisation, etc., all influence hedging. As a progressive company it is no surprise that Xero looks beyond the “vanilla”. Says Xero’s Senior Treasury Analyst, “Hedgebook allows us to be more dynamic in the way we manage our risk positions. Hedgebook’s strategic decision-making tools play a key part and gives us the ability to roll forward hedging outcomes. We can visualise our hedge position not only today or the end of the month but also where we’ll be in three or six months’ time under different scenarios. With a commitment to treasury excellence, critical appraisal of previous hedging decisions is an important aspect of Xero’s approach to foreign exchange risk management. 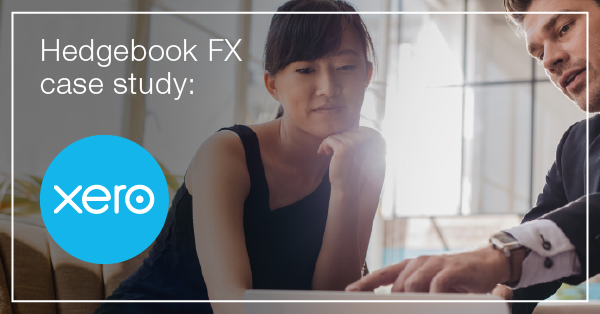 Xero’s treasury team use Hedgebook’s reporting tools to gain insights on rate achieved outcomes when measuring actual performance against alternative, hypothetical hedging approaches. Xero has grown into a mature business with shareholders to answer to. Managing financial risks appropriately and smoothing volatility in group cashflows is a fundamental requirement of the treasury function.